Another successful Fashion for Breakfast was hosted last week at Cecconi’s, where those in PR, writing, media, fashion, tech, beauty, social media, and more mingled over delectable breakfast bites while listening to fashion maven Rebecca Minkoff and her tech guru brother Uri Minkoff, who shared with us how they are growing a brand in a unique and different way. 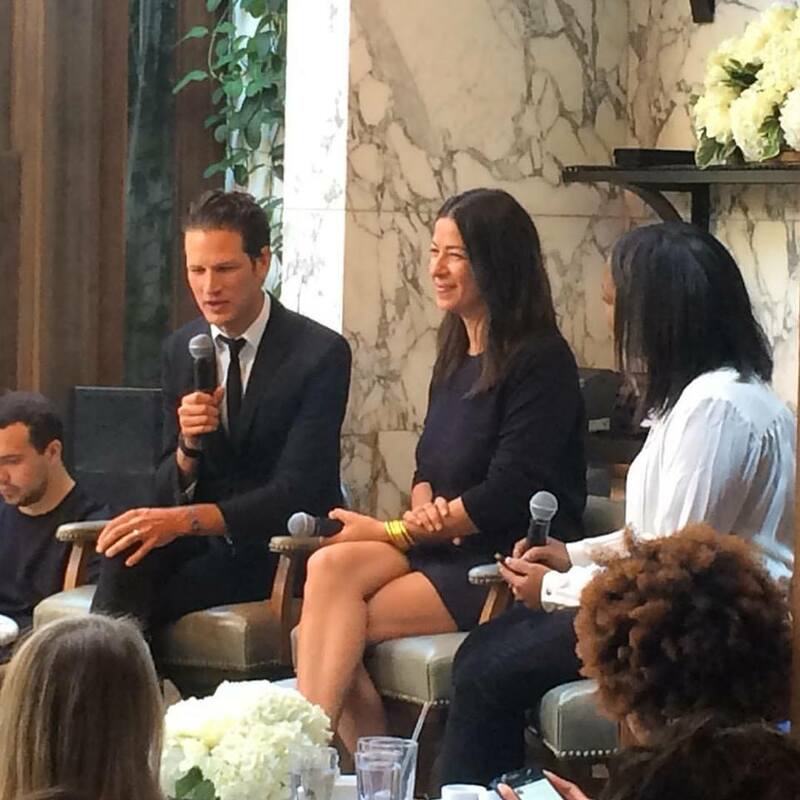 Fashion for Breakfast with guests Rebecca and Uri Minkoff interviewed by Jennifer Pauline. While at the brunch, I didn’t fully grasp their tech concept until I went into the new luxurious Rebecca Minkoff store on Melrose afterwards. Their largest US store opened last week right after our brunch. Rebecca Minkoff, the largest tech fashion brand is all about involving the consumer. As soon as I entered the airy light space, a grand mirror reflected my image. This massive mirror doubled as an interactive computer screen, so I could choose a complimentary beverage, or locate a stylist to help me shop. A text was delivered to my cell to let me know my Perrier was on its way. Hello, shopping wave of the future! 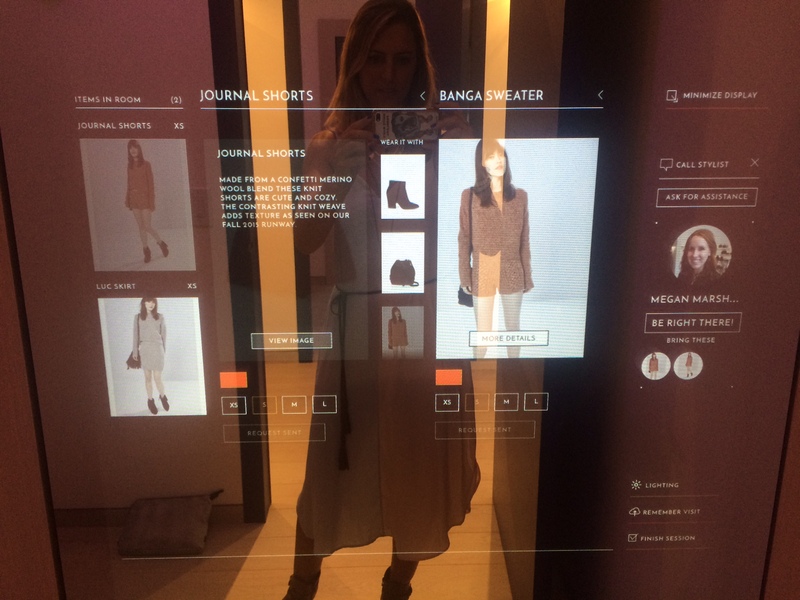 Rebecca Minkoff’s new store on Melrose offering a tech experience. Uri Minkoff happened to be in the store that day patiently guiding customers through the new experience. His own line of sleek essentials for the modern minimalist are in the store too. He kindly showed me how efficient the tech dressing room options could be. First, I could change the lighting based on various LA lighting settings like “Runyon Canyon,” all with just the swipe or push on the mirror screen. The clothes I brought in already shot signals to the technology sensors above and my items popped up on the mirror allowing me to see different ways to pair the items. I could even push a button if I had the wrong size or want a different piece to pair with what I had, and a stylist (with her face popping up on the mirror) would text me she was coming to bring me the new items. Not only do you not need to leave the dressing room to get help, there are no registers in the store because you can ‘Check Out’ right there in the dressing room on their mobile pads! Also, your shopping experience and style options can be saved to your account, which allows you to save your clothing styles and shopping history, as well as I assume give the Minkoffs some concrete research evidence about the shopper. Rebecca Minkoff. She even has a trendy workout line. Rebecca said, “They feel dialogue is valuable, and thus social media is a great way to deal with consumers directly.” Powered by Ebay, there are even fashion tech accessories being sold in the store, like bracelets that will charge your gadgets or send you an alert or buzz when it is an emergency message. Rebecca shared with us how she learned how to sew when she was 8. She described her new clothing line as “Scan-Do,” translating as Scandinavian and Japanese, luxury with a great price point. The stores she explains are built for the next generation shopper – the millennial (first job, first date, first love), the girl wanting to be social, the girl hyper connected to her phone… She wants to be listened to and wants to give her input. 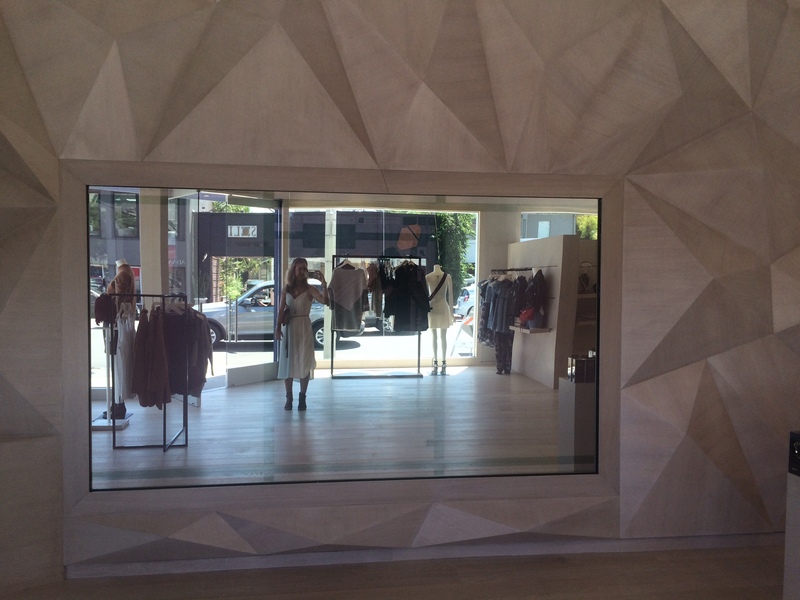 Rebecca Minkoff’s new fashion tech store on Melrose. What advice did Rebecca Minkoff have for us? 1. Persist. She was told NO more times than you can imagine. 2. Surround yourself with strength. Know what your strengths are. 3. Think: How are your services different? Who is your audience? 4. Advice on Instagram and branding: Be authentic. Not only will the store showcase their already successful clothing lines, but the store will be used for hip hop yoga in the dark, and as an interactive space for emerging artists. The Minkoffs are revolutionizing the shopping experience, one that now is digitally advanced. Watch a video to see the store’s tech fashion features that may blow your mind. 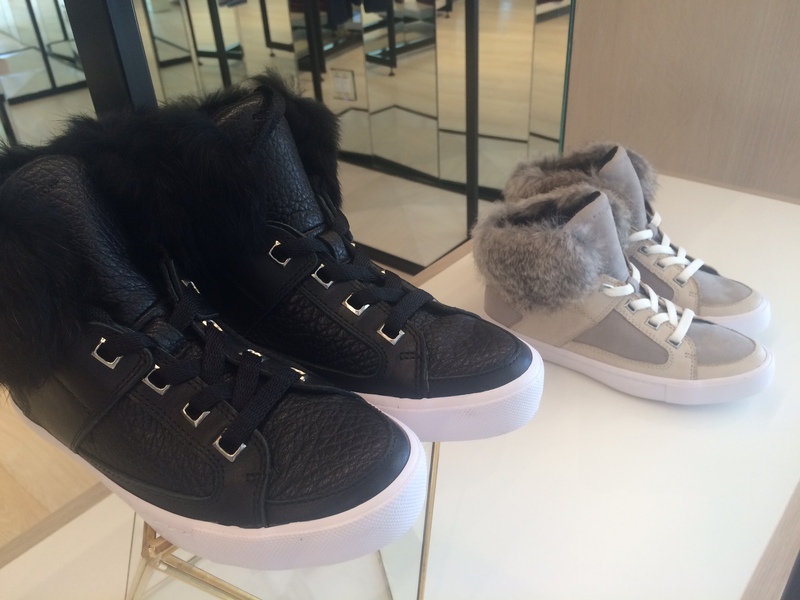 The Rebecca Minkoff stores were rated the world’s top 10 innovative companies of 2015. My hunch is that we will see more and more stores popping up across the US using their similar tech friendly futuristic shopping capabilities, whether you want it or not.